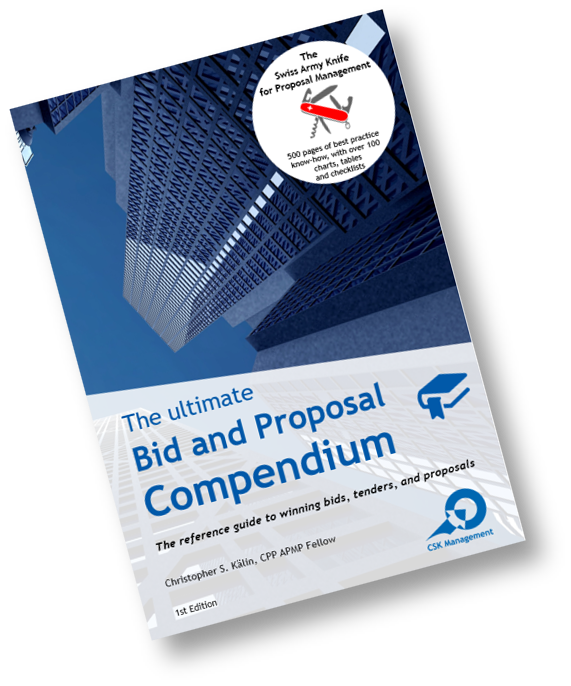 The Ultimate Bid and Proposal Compendium is the most complete reference guide for winning bid, tenders, and proposals. It provides everything you need to know for bid and proposal managers, business development professionals, B2B sales executives, proposal writers and grand seekers. On over 450 pages, with over 100 charts, tables and checklists, it covers best practices for truly all aspects of bid and proposal management, including all topics tested in the APMP-Foundation™-Level exam. Topics include: the successful bid organisation, the buyers' view, the BidMaster process framework, developing compelling stories, the proposal structure, writing guidelines, public and commercial tenders etc. With the purchase of the Compendium, you receive free access to the CSK Knowledge Portal, containing comprehensive checklists, useful tools and lists, document templates, useful links from the world of bid and proposal management, the CSK glossary, and the CSK literature list. He gives public and corporate seminars, conducts live and virtual training programmes on how to win more business with convincing proposals and bid management best practices. He has worked with companies around the world to improve their success rate, creating over 50 billion dollars in business. He works across many industries, including IT, telecoms, defence, transportation, financial industries, event organisation, gambling or business outsourcing. He was co-founder and chairman of the German speaking APMP chapter (Association of Proposal Management Professionals) and Regional Director for Europe/Africa. He is APMP certified at the Professional Level (CPP APMP) and is an APMP Approved Trainer. In 2013, he also received the prestigious Fellows Award.